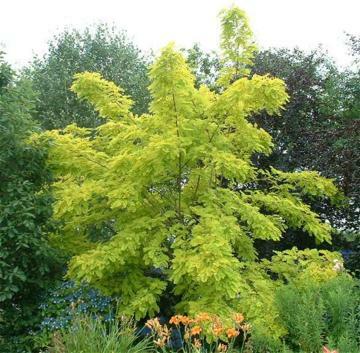 This medium sized tree has much-divided, ash-like leaves which are rich golden colour when young, maturing through yellow to yellowish-green as they mature. They then become orange/yellow in autumn. Fragrant white flowers, though sparsely produced. Stems can be thorny. Best in fertile moist, well drained soil but tolerant of poor soils and periods of drought. Dislikes very wet or waterlogged conditions. May be susceptable to a viral disease that affects trees in some areas. Can be pruned if required, preferably in autumn. Very popular ornamental tree. Often wrongly planted in small gardens, though it soon needs a reasonable space.